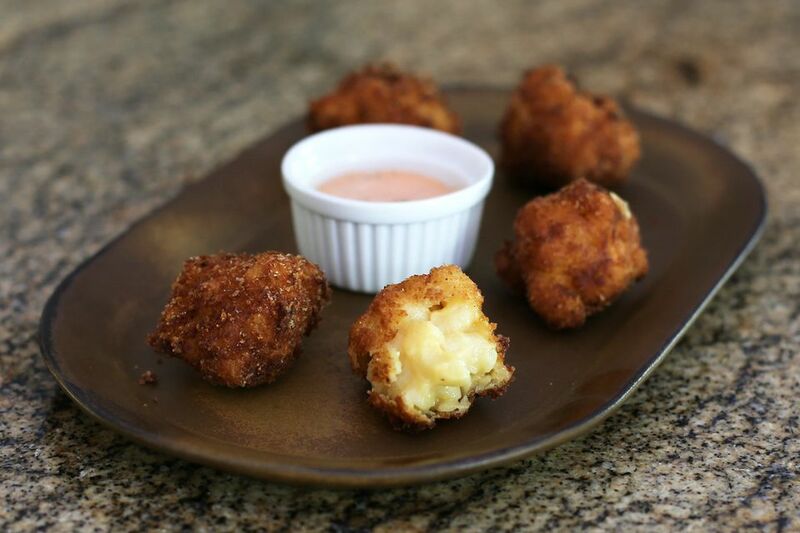 These macaroni and cheese bites are incredibly delicious, and they are an excellent way to use leftover mac and cheese. The deep-fried fritters are an addictive snack, so be sure you make enough to go around! Serve the mac and cheese bites as a snack with a ​spicy sriracha mayonnaise, ranch dressing, or a honey mustard dip. Heat the oil in a deep, heavy saucepan to about 360 F, or until a cube of bread browns in about 30 seconds. Shape the cold macaroni and cheese into small balls. In a shallow bowl, beat the eggs lightly with 2 tablespoons of milk. Dip the mac and cheese balls in bread crumbs, then into the beaten eggs, then in crumbs again. Drop carefully into hot fat and cook, turning, until golden brown, about 1 to 2 minutes. Remove to paper towels to drain; keep warm while making subsequent batches. To keep batches warm while making more, place the drained fritters on a rack in a baking pan and place it in a 200 F oven. Add some crumbled bacon, jalapeno peppers, diced pimientos, or cooked vegetables to the mac and cheese mixture before breading. Put a small chunk of ham or cheese in the center of each croquette before breading. Add a few tablespoons of grated Parmesan cheese to the breadcrumbs.